Pat the fillets dry using paper towels. Season with the salt and pepper, and rub with olive oil. Heat a large nonstick pan until smoking. Seal the fillets all sides until a golden crust forms. Place the fillets on a baking sheet and grill for 5 minutes or until done as preferred. Mix the rest of the ingredients well and spoon onto a plate. Roll the fillets in the herbs and leave to rest for 10 minutes. Cut into slices and set aside. In the meantime, arrange the bread chunks on a large baking sheet. Use half of the olive oil, mix in the garlic and drizzle over the bread. Grill in the same oven as the fillets until golden and crispy. Mix the tomatoes, basil, the rest of the olive oil and balsamic vinegar in a large bowl. Season with the salt and freshly ground pepper. 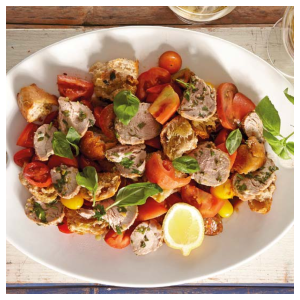 Mix in the bread chunks and dish onto a serving plate.Top the salad with the fillet strips.